Excel Database Reporting Tools (XLReportGen) provides a fast and convenient for reporting data in Excel from one or multiple database sources. The reporting tools connect to a range of database formats and provide tools to join and combine data for sophisticated and flexible Excel reporting. Powerful reports can be created and format using the inbuilt Excel functionality and are updated as data is feed from the connected database sources. Updating and report generation to alternative file formats is automated and can be scheduled to run on a periodic basis. A short learning curve is facilitated by the familiar use of Excel for creating report structures and styles. The reporting tools use optimized SQL query statements to extract and combine data from external sources and can also insert and update the backend databases as required. Full support is provided for standard SQL syntax including DML (Data Manipulation Language), DDL (Data Definition Language) and DCL (Data Control Language). No programming experience is required as the database reporting tools are driven entirely via the provide user interface. Database connections are made via ADO and able to connect to all database formats including Oracle, Sybase, Informix, Teradata, DB2, dBase, MySQL, MS SQL Server and Access. The Excel reporting tools support the combination of data from multiple databases and database formats within the same reports. SQL statements that request data for reporting can be dynamic with parameters specified to extract and report the corresponding data. The reporting tools support command line arguments so that the solutions can be integrated into external applications and alternative development projects. Excel database reporting supports the use of images inserted with rules for size and portion in catalogs and reports. Multiple simple to complex reports can be set up and generated within the same Excel workbook. The reporting tools also allow for the converting of Excel reports and any Excel or database data into various other formats including Text, CSV, XML, HTML, DBF and Lotus 123. 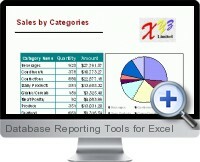 Excel reports can be set to generate automatically on a schedules basis such as daily, weekly, monthly etc.